I am so thankful to have the opportunity to pursue a Doctor of Ministry Degree at Drew University. The program that I will be involved in is the 21st Century Leadership Global/Online Concentration. I pray that every aspect of this experience in my life will be used to glorify God and to further the proclamation of the Gospel of Jesus Christ to the world. I am still basking in the glow of Holy Week....I hope it never ends. Sorry things have been so silent on my blog. Family, work, online classes and friends have taken precedence. It is Spring Break here at our school in South Korea and it is a wonderful privilege to have two of my friends--Chris and David (and three of David's children) visiting us here at our home in Asia. I post this mainly to express how meaningful it is to have my friends here visiting. They have taken their time and spent their money to come and visit me and my family and to be interested in our lives here on the other side of the world. Chris and David are precious friends and I am treasuring the moments that we have together here in South Korea. Growing Slowly Wise: Building a Faith that Works. David Roper, (Discovery House, 2000). 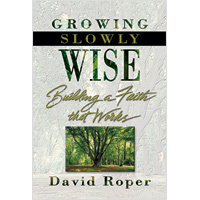 For more than a decade I have been involved in leading various weekly early morning men’s groups, and out of all the excellent spiritual books that the men and I have worked through together, none can compare to David Roper’s book, Growing Slowly Wise. This book plunges the reader directly into the Biblical book of James and focuses upon the idea of a holiness of heart and life—that works. It makes an effective connection between the pragmatic writings of James and the issues of holy living in the very real moments of life. Roper’s comments and reflections on the message of James resonate out of over thirty years of pastoring, a lifetime of biblical study and a knack for presenting and communicating the Word of God in a subtle, yet compelling manner that leads one to a response. Roper knows what it is to live the adventurous life of faith and he is able to lead others in this way as they are in the midst of regular lifetime activities. The key idea in Roper’s book is that all of us, in heart and life, are being formed in Christ and this formation takes place in the continual instances of day-to-day living. As Christians interact with the questions, challenges, joys and struggles of life in relation to the Holy Spirit and the Word of God, growth happens—growth that manifests itself in wisdom, holy living and a “beautiful” life. It is within this life of beauty and holiness that the gospel picture of hope and love resides and is realized by a seeking world. Roper does a masterful job of taking the “faith that works” of James and melding it with a faith that resides in God at the deepest levels of the human heart. Every chapter of Growing Slowly Wise is a pragmatic look at the living message in the book of James. Roper’s comments and insights into the scripture serve to focus the reader upon aspects of the message that are most relevant to current life and holy living. It is an approach to the Word that rests upon the idea that the message of the Bible is dynamic and is guiding the reader to respond obediently to the grace of God at work in their life. Upon completion of Roper’s book, Growing Slowly Wise, the reader is left with a sense of awe. There is a mature aspect of wisdom and a poetic element of insight in Roper’s words that combine with the powerful words of scripture in the book of James to create a sense of confidence in the fact that the daily lives of believers are to be worked out in the very hopeful realm of faith. Roper’s words remind us that holiness in life is realized in response to God’s leadings in the midst of the minute by minute dynamic of life. It is a slow process of growth, but the result is an aspect of wisdom in relationships and an essence of holiness in life that is well worth the wait. This quote really resonates with me. Sharing, preaching, teaching, speaking...anytime that I ever get to say anything in church or in a religious gathering, my words must include--Jesus. The grace, love, hope and life found in Jesus are always worth the time. 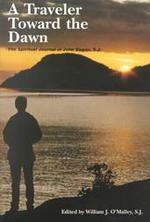 A Traveler Toward the Dawn: The Spiritual Journal of John Eagan, S.J., John Eagan, ed. William J. O’Malley, S.J. (Loyola University Press, 1990). A Traveler Toward the Dawn by John Eagan is one of the most treasured books on my bookshelf. I have read this book at least five or six times and I just finished reading it again. This is a book that has been extremely formative in my life. It is not a popular book and looking back I have no recollection as to how I ever came across this book. I know that I read it for the first time in the early 1990s and I know that I gleaned its title from the bibliography of another book that I was reading at the time. The copy of the book that I currently have in my possession is not my original copy. My original, marked up, tear stained copy is most likely sitting on a bookshelf in an office or a study of one of my friends. I have purchased many copies of this book and have passed them along to a number of people over the years. This morning, as I read the final paragraph of the book and closed the back cover, I had to take a few moments to reflect, pray and weep. The story between the covers of A Traveler Toward the Dawn deeply touches my heart. It is the story and spiritual journal of John Eagan, a Jesuit Priest of the 1950s, 60s, 70s and 80s, who spent most of his life teaching high school students and guiding them along in their spiritual journeys. John Eagan’s life was not only one of service unto high school students and a commitment to the life of being a Jesuit Priest but it was also the life of one who was hard after God. John Eagan was a seeker and a finder of God. In my earlier readings of this book I found appealing the connection between the very real life and heart of this man and his dynamic journey with his very immanent and loving Heavenly Father. This book was my first experience with terms like liturgy, daily office, contemplative prayer and spiritual direction, and it was my first exposure to the concepts of liberation theology and to the thoughts of St. Ignatius Loyola, the founder of the Jesuit order. I return again and again to this book because in John Eagan’s spiritual journal I find an honest account of a very ordinary person’s journey in Christ. In his writing I find a pilgrim who travels with the Lord through the desolation and the beauty of this world and of his own heart. As he wrestles with the issues of self-centeredness, the passage of time and the unrelenting reality of change, he is ever looking to God, desiring more and more of the Lover of his soul, and throughout his journey he finds God faithful. This book has greatly impacted my pilgrimage to God and I suspect, if given the chance, I will read it again as I travel toward the dawn. Below is a little bit of “blogging” by my daughter, Sarah. In her English class they are working through a study unit on poetry and one of her assignments was to identify a favorite poem, analyze it and write a reflection on it. I am flattered that she chose a poem that I wrote but even more than that I am pleased with her thoughtful and well articulated reflection on the poem. Below is the poem and Sarah’s reflection. Three souls from worlds apart share of themselves this day. A time of joy is had by all as they slide and swing and run. There is no language lost in words that love can say. We find great value in each other, the treasure of a friend. Have you ever had a friend from a different culture than your own? I have. Really good ones too! All my friends are a lot different than I am. That’s why I like this poem. The poem “Friends” by Ryan Roberts is about friendship and how precious it is. It does not matter if you come from a different culture or speak a different language, you can still be friends. Another cool thing about this poem is that it has a cool poetic device and a really deep meaning. “Friends” has the best and deepest meaning I have ever read before. Its meaning is how you don’t only have to be friends with people who look like you or even have the same culture, but with everyone. My dad is the author of this poem and he based this poem on my friend Yayoon, my sister Becca, and me. Yayoon is a little Korean girl that speaks only a few words of English. Yayoon's mom is my dad's secretary so we went out to dinner with them. The three of us girls became friends so after that we played together sometimes. Even though we couldn’t speak the same language we still had love and friendship. That’s really all you need. I know that we all need to be reminded of that every once in a while. This poem doesn’t only have a deep meaning it has a really cool poetic device called end rhyme. End rhyme really works in this poem because it makes everything just flow together. End rhyme is in lines 1 and 2, 3 and 4, 5 and 6, and 7 and 8. With a meaning that is deep and poetic devices that are good, what poem could be better? This poem reminds me that I shouldn’t just be friends with people that look like me or have the same language. If I do, I’m missing out on a big part of life that could have been great. It has also encouraged me that it’s good to be friends with people who are different from me. “Friends” is a poem that everyone needs to read. 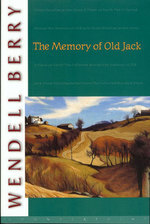 I just recently finished reading the book, The Memory of Old Jack by Wendell Berry. I was looking for a thoughtful and heartwarming read and I was not disappointed with this book by Berry. This is the second book in Berry’s fiction series that is based in the imagined farming community of Port William. The first one I read by Berry was the very satisfying book titled, Jayber Crow. Without spoiling the book, The Memory of Old Jack takes place in a small farming community at the tail end of the 1800s. The story is about the land, farming, hard work, relationships and the unique treasure of people. The story is a collage of memories of an old man and a life well lived. Throughout the book is realized the “beauty” of God’s creation in the form of work, agricultural living, farm animals and relationships. This book is full of practical wisdom that has been lived and learned the hard way. As one who grew up on a farm and who has always been fascinated by the wisdom of the aged and the artistry of work, I found Berry’s book deeply satisfying. Throughout The Memory of Old Jack I found my memory quickened with recollections that surfaced in the form of reminiscent tears. In the work gnarled hands and the tapping cane of Old Jack I could see my great grandfather and in Old Jack’s encouraging words and commitment to family I could see my grandfather who was not only committed to caring for and looking in on his brothers and sisters but who was also available to love and mentor me, his only grandson. In Berry’s book is realized the beauty of human life and also the banality of living. Life is not perfect and this reality is evident in Berry’s story line and characters in the novel. For a piece of fiction, this book is a very real depiction of life as some have known it to be. It is the real moments of life, the good and the bad, that make up what are considered life memories. It is these types of memories that are touched upon in Berry’s book, The Memory of Old Jack. It is a novel that I recommend to you as a book of memories from long ago that you will remember. "I feel thin, like butter spread over too much bread." I learned a lesson this week. Sleep is important. The last couple of weeks or so have been busy and I have been up late at night finishing up graduate work homework, reading things that I want to read and doing things that need to be done. Looking back over this time I realize that I have averaged between 4 and 5 hours of sleep a night. It really hasn’t been too bad—a little rough at the sound of the alarm clock, but otherwise, doable. A few days ago I noticed that I couldn’t concentrate on and enjoy anything that I was reading and when it came to writing I couldn’t come up with, let alone harness, a creative thought. It felt like my brain was “buzzing.” Apparently 4 or 5 hours of sleep a night is not enough sleep for me. For me, this sleep thing is a stewardship issue. My life, my body, and my mind are for God, for my family and for others. I do not live in isolation--my life affects other people and I want to be careful to not take my health for granted. Over a period of time poor stewardship in the midst of productive effort leads to a state of diminishing returns. I found this to be the case in my body as well. I must be careful and responsible as it relates to my body, my mind and my spirit and a good place to start is with a good night's sleep. What are you running from? What are you chasing after in your life? Maybe lots of things come to mind or maybe nothing comes to mind. Chances are, you are doing one or the other, either running or chasing…or you are going nowhere. Inactivity doesn’t appear to have been an option for young Timothy. In verse 11, the Apostle Paul tells Timothy to both “flee” and to “pursue”. It is important to note that Timothy was urged to “flee” from pride, lust, greed, glory and power and yet in the same breath Paul told him to “pursue” things like righteousness, godliness, faith, love, perseverance and gentleness. In many ways Paul’s exhortations seem obvious. Why would Timothy do otherwise? However, it seems we are all inclined to do just the opposite of what we should do. Again, I have to ask, “What are you chasing?” We all love chase scenes in movies and on TV. With every stride the excitement builds as the chase scene winds its way into buildings, up staircases, out windows, over ledges, through doorways, under bridges and around corners. The pursuit ultimately culminates at the end of a dark alley in a crash of trash cans as the pursuer tackles and apprehends the pursued. There are things in life from which we should flee and there are things in life that we should pursue. We must be careful not to confuse the two. As a leader in the church at Ephesus, Timothy was called to confront the all too tempting issues of riches, pride, lust, power, security and popularity. He was called upon to “flee” from these things, and so are we, yet these are the things that secular culture holds up as elements of the “good life.” We must be careful to pursue the right things. Be brutally honest with yourself. What are you pursing? Make a list. Compare your list of pursuits to the Apostle Paul’s list for Timothy. The contrast between what to “flee” and what to pursue is vivid. Paul’s list of pursuits deals with both the body and the soul. There are some things that a person of God should be going after. The first is “righteousness.” Paul isn’t talking about a self-centered, pious righteousness but rather he is talking about the righteousness that comes from Jesus Christ. This is a righteousness that finds its meaning, value and purpose in the love and grace of God. Nothing can be done to earn this righteousness. It comes from the Father and supersedes any position or popularity that the world esteems. It is about being “right” in the right way and for the right reasons. All security and stability for living is realized in the righteousness that is found in Christ. Pursue it, look for it, and focus upon it. It is life. The second is a “godly life.” This is the place of a pure heart. Don’t let anything keep you from seeing God. Lust, greed, selfish ambition, and a host of other “inclinations” will serve to keep you from seeing God clearly. Run from that junk and go after God. If you seek him, you will find him. The third is faith. Eugene Peterson says that faith is the result of combining imagination with participation. We become too fixated on the reality of earthly things. There is something more to this life and it is realized in God. Spend some time reading in the Bible about the God who created all things, who wants relationship with humankind and who in love offered up the life of Jesus on the cross that we might have eternal life. Faith comes from hearing and reading the Word of God. Use your imagination as you read about a God who is ever reaching out to you with love and grace, who dwells within your heart and empowers you to live through the Holy Spirit. Enter into that love. Participate in the grace of God in your life and pursue faith. Love--Remember God loved you and loves you, therefore we must respond in love towards others. It doesn't matter who they are or what they are doing. We must not hate nor despise. We must love. Persevere--Hang in there. Keep loving them. Don't give up. Stand up for what is right but do it in the right way. Don't wash your hands of those that are deceived and that stubbornly continue in their ways. Don't throw in the towel. Keep on pressing in on them with love. Don't quit. God didn't give up on you--don't you give up on them. Gentleness—When in doubt, be gentle. Even when seemingly justified, nothing hurts worse and is misunderstood more than harshness. Don't get sucked into foolish arguments--even when you are right. There is another way and it is the Jesus way. It is the way of gentleness. Paul's directives to Timothy aren't easy. Our natural responses to people, situations and life aren't always the best responses. The things that we are to pursue don't come naturally. Instead, it seems as if they are ever trying to elude us. We must pursue them. Go after righteousness, godliness and faith and as you do, live a life of love. Even in the midst of frustration don’t quit, but rather deal with others gently and lovingly. Enjoy the chase. As you pursue the things of God you might be surprised to find in the end you have apprehended life.